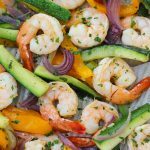 Juicy and plump shrimp are roasted in the oven along with a colorful collection of vegetables – zucchini, peppers and onions. This vibrantly beautiful dinner is all cooked on one sheet pan, making dinner prep easy, quick and full of fresh flavors. Preheat the oven to 475 degrees Fahrenheit. Place a large rimmed baking sheet (I use a half sheet size) into the oven, so that it will heat up as the oven is preheating. Meanwhile, prep the vegetables. Slice the zucchini into 2 1/2 – 3 ” long, 1/2″ thick slices, the bell pepper into 1/3 ” thick slices and the onions into 1/4″ slices. Since the zucchini will cook the fastest, the bell pepper just a bit longer and the onions take the longest time, cutting them into different sizes will help them to be done cooking at the same time. Toss the vegetables in a large bowl with 1 Tablespoon of olive oil, 1/4 – 1/3 teaspoon salt and ground black pepper. In another large bowl, combine the peeled and deveined shrimp (you can keep the tails on or off), garlic, herbs, paprika, 1 1/2 Tablespoons olive oil, lemon juice, fresh herbs 1/2 – 3/4 teaspoon salt and ground black pepper. Mix to combine. Transfer the vegetables to the hot baking sheet. You should hear the vegetables sizzle as they hit the baking sheet. Spread them out evenly on the baking sheet. Bake in the preheated oven for 10-15 minutes, turning over half way through. You can turn up the broiler during the last 2-4 minutes, to make the vegetables more golden or to get a char on them, if you’d like. Remove the vegetables from the baking sheet and transfer them to a bowl or a serving plate. Cover to keep warm. Place the shrimp on the same baking sheet (it should still be hot), spread them out evenly and return to the oven. Bake for 3-5 minutes, then broil for 2-3 minutes. Remove from the oven and add to the roasted vegetables. I like to add another 1/4-1 /2 Tablespoons of olive oil, another spritz of lemon juice and more fresh herbs to the shrimp and veggies right before serving.